Fantastic Worlds: Science and Fiction, 1780-1910, a Smithsonian Libraries exhibit, opened in the National Museum of American History on July 1st. 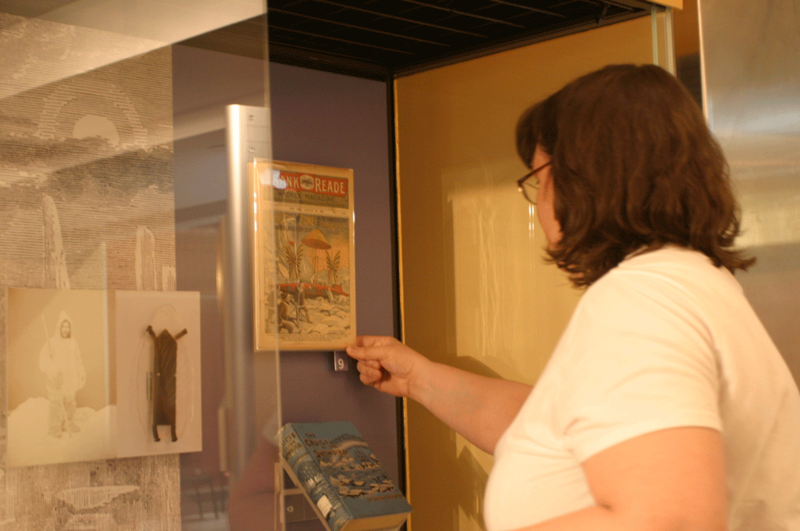 It is the first exhibit to open in the recently renovated Smithsonian Libraries Gallery in the museum’s west wing. 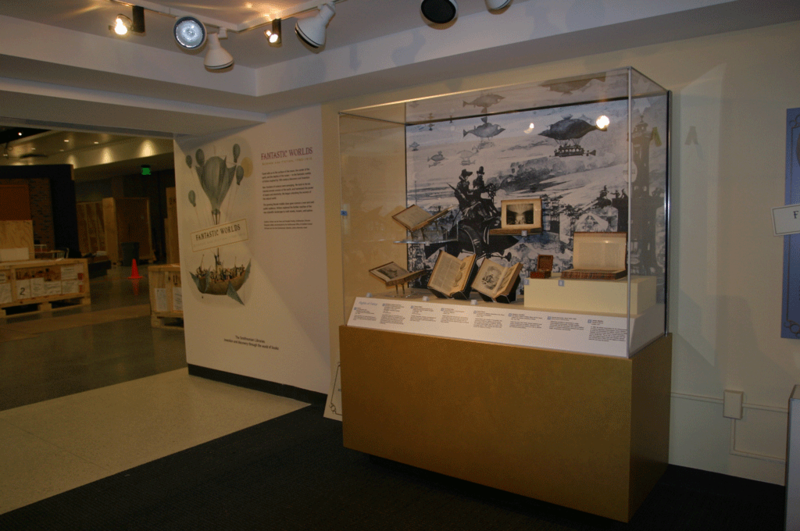 OEC designed, built, and installed the exhibit, which focuses on early works of science fiction and fantasy. At this time, new scientific discoveries and technologies inspired writers and artists to create fantastical tales about everything from traveling to other planets to resurrecting the dead. 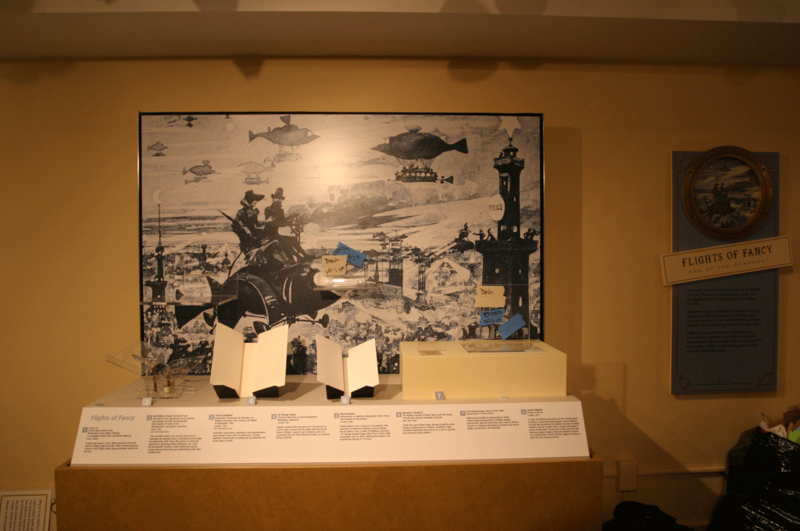 The exhibit is divided into seven sections ranging from Terra Incognita to the Rise of the Machines. 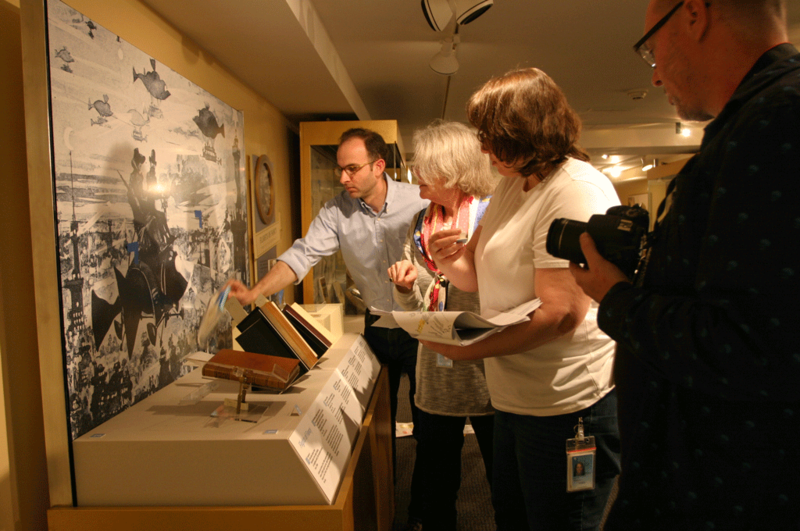 Each section features books and artifacts from the Smithsonian Libraries collection, as well as objects on loan from the National Museum of American History and other collections. To bring these fantastic worlds to life, we designed and fabricated section panels, reader rails, graphics for the backs of cases, object mounts, in-case pedestals, and custom made acrylic mounts. We also made the two acrylic frank cases in the center of the exhibit. 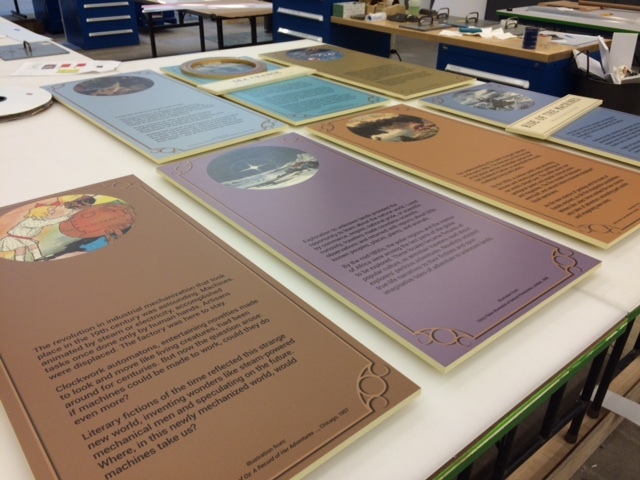 Section panels being prepared in OEC’s shop. The pedestals, reader rails, and back wall graphics are ready for the cases. Working with historical books presents unique challenges. Because the books are very delicate and easily damaged, there are limits on how they can displayed and for how long. As a result, there will be five object rotations over the course of the exhibit. 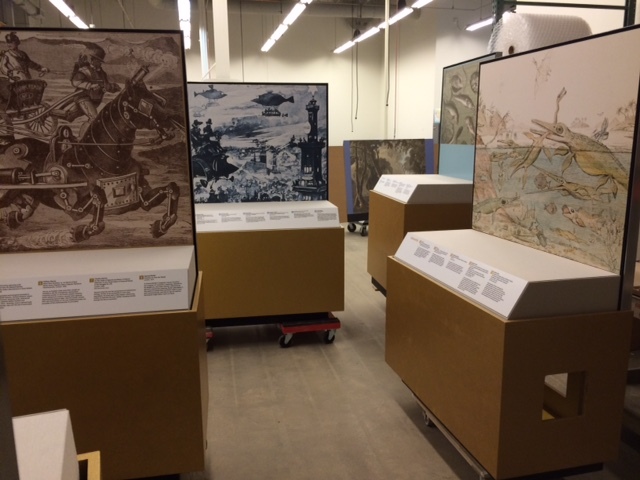 Our designers worked closely with curators and conservators to plan the five different layouts for each case. Each design needed to account for books of different sizes in a variety of display positions. In some cases, this means that a page may be turned or the position of the mount may be changed. If there is more than one available, an entire book may with swapped out for a different copy. OEC staff and Smithsonian Libraries conservators arrange books for display. Another challenge presented by this exhibit came in the form of a 700-pound machine. 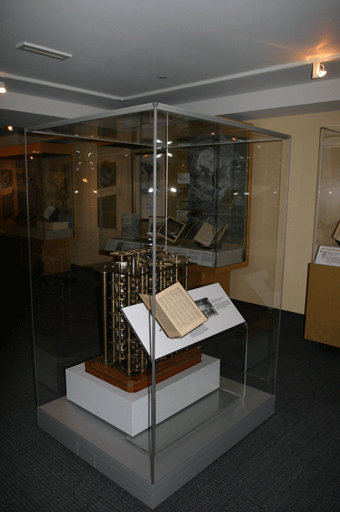 In order to display the heavy 1963 model of Babbage’s Difference Engine, OEC custom made a frank acrylic case and built extra support systems into the base. Although Babbage never completed it, his Difference Engine is considered a forerunner to the modern computer. It was intended to compute and print mathematical tables. After nearly a year of planning and fabrication, Fantastic Worlds began installation in May. Conservators from Smithsonian Libraries were on hand throughout the installation to handle all of the rare, and often fragile, books. 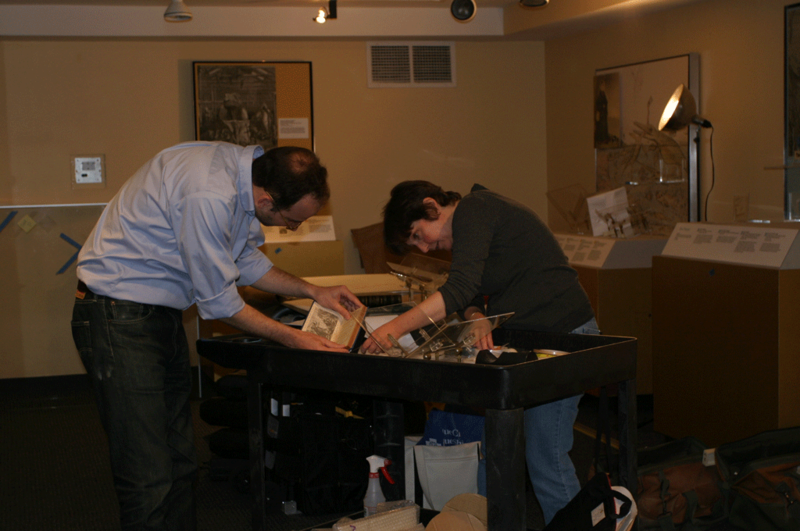 Conservators from Smithsonian Libraries prepare a book for the exhibit. While they handled the books, we handled the cases, mounts, reader rails, number plaques, and graphic panels. 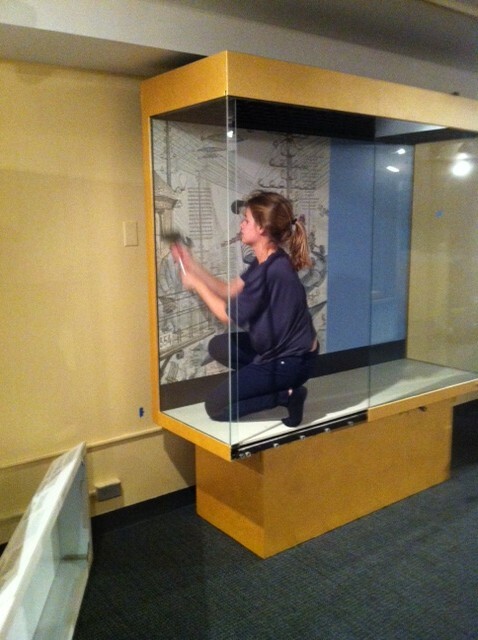 Graphics specialist Kate Fleming installs a graphic to the back wall of a case. Graphic specialist Jessica Schick attaches a number tab. A case waiting for its books. Soon enough, it all came together! Come take a journey to these fantastic worlds yourself the next time you visit the National Museum of American History. Fantastic Worlds: Science and Fiction, 1780-1910 is open until October 2016.